The members of the Korean- American Children’s Culture Circle range in age from five to fifteen. 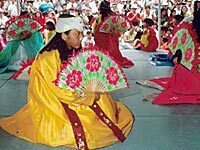 Their program includes two Korean dances, describing the unique clothing the dancers wear, explaining the children’s Korean names, and telling a folktale with the use of large, colorful posters. Along with teaching about Korean traditions, a goal of the group is to give a positive message about adoption and maintaining cultural links with children’s native homeland. Weekends are best during the school year. Willing to travel up to 100 miles from Milwaukee.